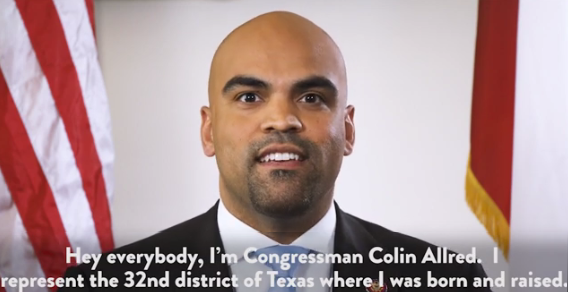 The Weekly Democratic Party Address was delivered by Rep. Colin Allred of Texas highlighting the passage of H. Res. 271, a resolution condemning the Trump Administration’s assault on people with pre-existing conditions and affordable health care. 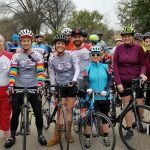 “We’re at our best when we look out for each other, just like the community in North Texas looked out for me. “That’s why this week, I was proud to lead a bipartisan resolution that puts the U.S. House of Representatives on the side of the people and protecting our health care. “In an attempt to fulfill an empty partisan promise, the Trump Administration has decided to work to invalidate the entirety of the Affordable Care Act in federal court. “This is unacceptable. We can’t go back to the bad old days when people were denied care because they had a pre-existing condition. A Congress that works For The People works to make health care more affordable, not to take it away. 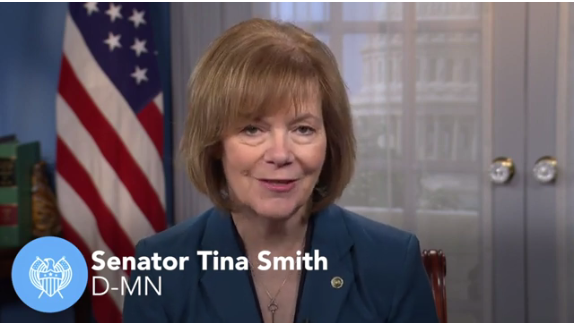 The Weekly Democratic Party Address was delivered by Senator Tina Smith of Minnesota who spoke about the climate crisis and the Democratic caucus committee established to address it. 3) Congress should take immediate and bold action to address this challenge. 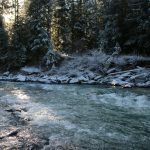 “These points should not be controversial. And the conclusion that climate change is an urgent problem is supported by an overwhelming weight of scientific evidence. Unfortunately, too many Republicans in Washington right now—and particularly our current President—refuse to accept these facts. 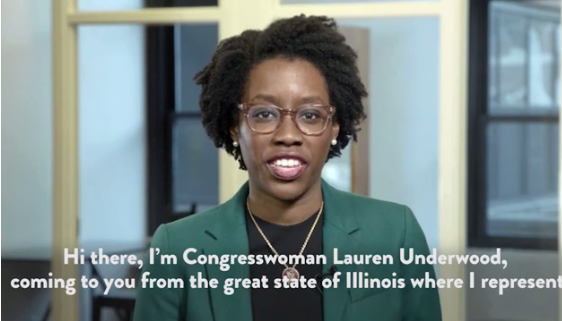 The Weekly Democratic Party Address was delivered by Congresswoman Lauren Underwood of Illinois highlighting Democrats’ efforts to protect people with pre-existing conditions, lower heath care costs and push back against cruel Republican plans to cut Medicare and Medicaid. “In the weeks and months to come, my colleagues and I are going to keep moving forward with legislation to reverse and block the Republican sabotage of affordable health care and instead move our current system and make it more affordable – with lower health costs and lower prescription drug prices for seniors and families across America. 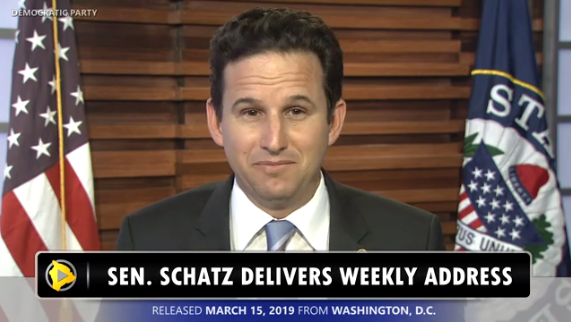 The Weekly Democratic Party Address was delivered by Senator Brian Schatz of Hawaii and discussed the heinous budget introduced by the Republicans’ president. So this budget makes very clear the difference between Democrats and Republicans. Republicans are all about tax cuts and paying for it by cutting health care. And Democrats want to expand health care coverage, invest in students, and protect the air we breathe and the water that we drink. 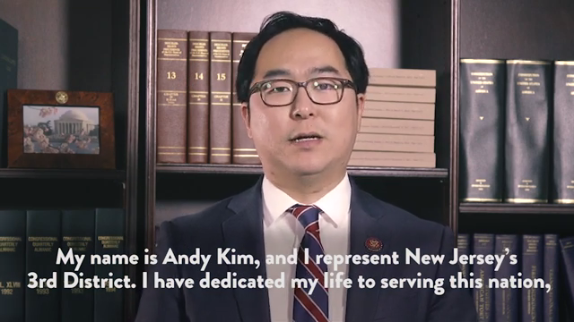 The Weekly Democratic Party Address was delivered by Rep. Andy Kim from New Jersey speaking about H.R.1 – the For The People Act – an historic reform package to restore the promise of our nation’s democracy and return the power to the people. 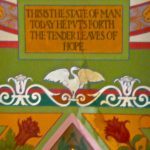 “Our nation needs a government of service. “It was this sense of service that founded our nation and built the extraordinary institutions of democracy that we have been entrusted to protect. That is the oath that we swore. “But as we look at the stagnation and gridlock, we must be honest with ourselves that these institutions have been weakened. That we do not have the quality of public service that the American people deserve. “A government for the people requires a government of the people. “We must help more Americans to participate in their democracy. We need to work to remove barriers to voting, encourage more Americans to step up and run for office, urge them to vote and to engage with their elected representatives. 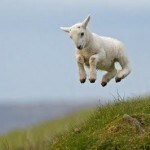 “We need to stop gerrymandering from diluting the voice of the people, to make our system fairer and more just. “We need a government the understands that the core unit of our democracy is the citizen, not the dollar sign. “H.R. 1 represents a bold effort to do just that. 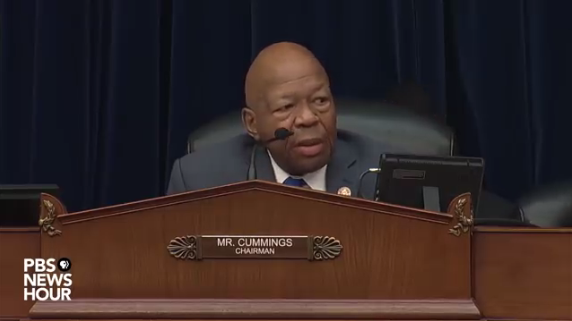 This past week, Rep. Elijah Cummings (D-MD), chairman of the House Oversight Committee, made a strong closing statement following a hearing into the blatant criminality of Donald J. Trump – as a businessman, as a candidate, as the leader of the Republican Party, and as the Republicans’ president. 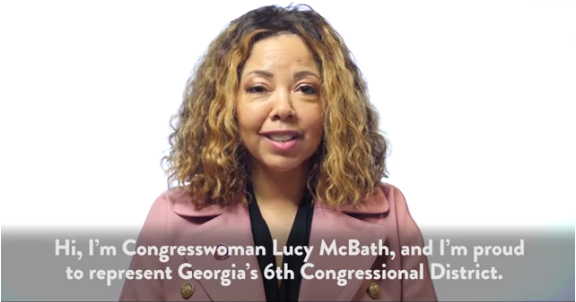 The Weekly Democratic Party Address was delivered by Congresswoman Lucy McBath from Georgia and explains the work she and House Democrats are doing to pass commonsense gun safety legislation. “This coming week, H.R.8 the Bipartisan Background Checks Act of 2019 will come to Floor of the House for a vote. This historic, bipartisan gun violence prevention legislation will ensure background checks for all gun sales, including unlicensed gun dealers. “The overwhelming, bipartisan support for universal background checks symbolizes the power of advocacy and the incredible power of the survivors, family members and students who have shared their stories as they advocate for commonsense gun safety solutions and demand that we act to address gun violence. 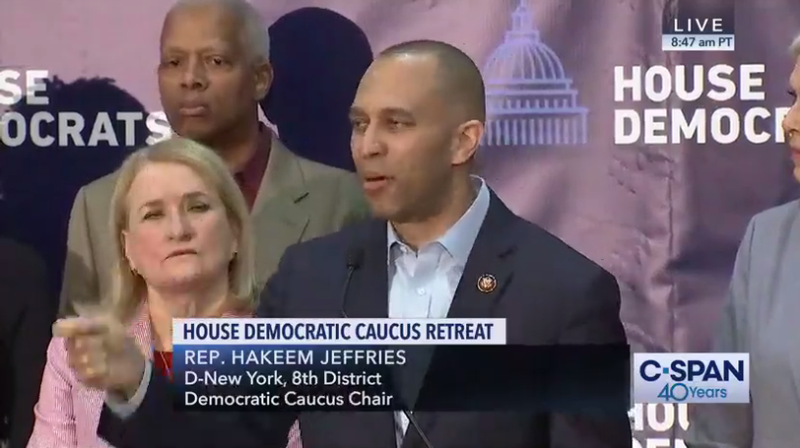 “House Democrats are taking action to make sure our communities and our nation are safer. “The President’s unlawful declaration over a crisis that does not exist does great violence to our Constitution and makes America less safe, stealing from urgently needed defense funds for the security of our military and our nation. This is plainly a power grab by a disappointed President, who has gone outside the bounds of the law to try to get what he failed to achieve in the constitutional legislative process. “The President’s actions clearly violate the Congress’s exclusive power of the purse, which our Founders enshrined in the Constitution. The Congress will defend our constitutional authorities in the Congress, in the Courts, and in the public, using every remedy available. 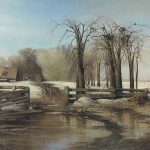 “This issue transcends partisan politics and goes to the core of the Founders’ conception for America, which commands Congress to limit an overreaching executive. The President’s emergency declaration, if unchecked, would fundamentally alter the balance of powers, inconsistent with our Founders’ vision. “We call upon our Republican colleagues to join us to defend the Constitution. 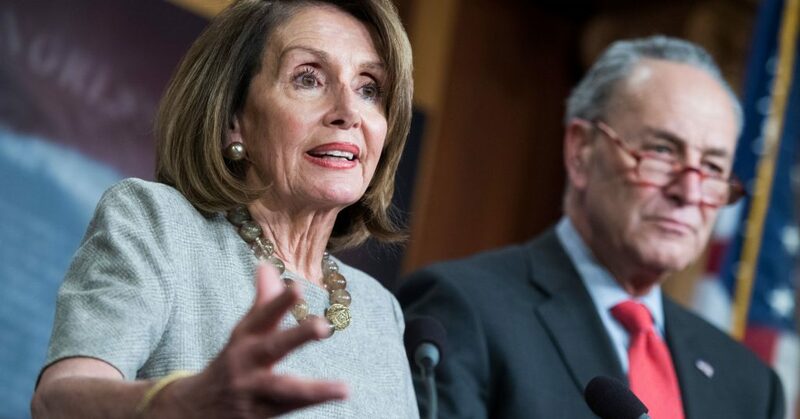 Just as both parties honored our oath to protect the American people by passing the conference committee bill, the Congress on a bipartisan basis must honor the Constitution by defending our system of checks and balances. Newspaper reactions to the national “emergency” declaration are here.